For those of you that pre-ordered Uncharted 2: Among Thieves, you now have access to an exclusive beta of the game which features a few multiplayer modes. Among those modes is the new co-op mode called Gold Rush. 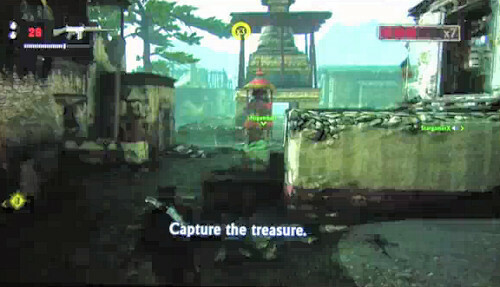 The goal of this mode is to steal a treasure and bring it to a capture point, all the while avoiding waves of enemies. Each successive capture increases the difficulty and number of enemies. Like other survival and Horde type mode, we found this to be quite entertaining. There's a few new things added to the game since the last beta. The biggest co-op addition is the new assists system. There are times when an enemy will grab your friend, and you'll notice a blue circle timer and icon above their head. You can then run up and press a button to unleash an attack and knock the baddie off. Weapons feel tweaked, and on screen indicators appear more clear. Overall the Gold Rush mode is a really intense version of the popular Survival modes in co-op games lately. We found that after wave 6 things got really difficult and we rarely made it much further. You'll get three tries at it before it's officially game over. After your done you'll level up your character with the points earned, as well as earn cash. This cash can be applied to buy new character skins, taunts and even upgrade your weapons for the various co-op modes in the game. The scoring itself it pretty addictive, with a team based multiplier that increases as the group does better. You'll also unlock bonus scoring by picking up small pieces of treasure, or completing badges like multiple hand to hand take downs, successive headshots, and others. With two co-op modes already unveiled, we can't wait to see what Naughty Dog has up their sleeve for the remaining ones in Uncharted 2. Hopefully we'll see something completely original and fresh. Even if it's just a take on an existing concept, we don't doubt it'll be a great co-op experience. It's just too bad we don't have actual co-op during the game's story! One final note, the new NaughtyDog website has launched, complete with stats from the game linked to your PSN ID. Be sure to check it out and look at all of your co-op progress! Editor's Note: We apologize for what may or may not be an offensive name by some immature PSN user. It wasn't until after editing the video that we noticed what some random idiot thought would be a funny PSN ID. Page created in 0.4950 seconds.